Hello. I have everything to say, and nothing. From this time forward, I will misuse commas. Because writing allows you freedom. Once you learn it, you can break the rules. I find some comfort, in the rule-breaking. In Portland, Oregon, my home for three years, many good women are writing and rule-breaking. They live in this field dominated by men. I should look up whether women writers also earn less on average than men. Or, on second thought, I shouldn't. I should keep writing. 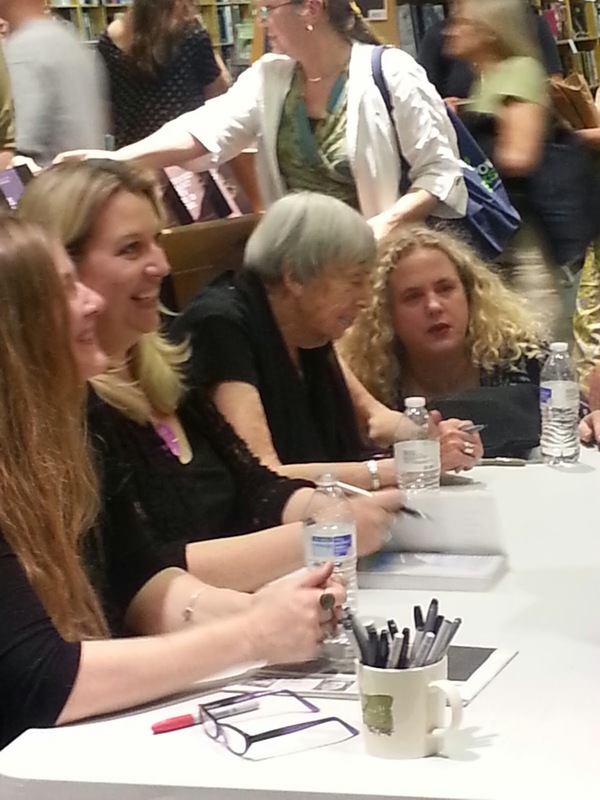 From left: Yuknavitch,Strayed, and le Guin. Bottom right: Cute blonde, my friend, Fufkin. At Powell's in Beaverton, May 15. At the event, each writer spoke about the books, their authors, the publishing business, and why readers are so important (buy from independents!). If I could tap every hour into their strength as true artists, my cup of inspiration would be overflowing. But my cup is close to empty. If I were a tell-all blogger, you'd understand every nuance of why. When does a writer start thinking her innermost story is the one everyone is interested in reading? Certainly, Cheryl Strayed didn't hold much back in Wild. Lidia laid it all out in Chronology of Water. I'm not them. I have many plans unfolding. A long road-trip, a relocation, a resettling. More writing, I'm sure. Close time with good people. In the next few weeks, I say my good-byes to Portland. I release my book. I re-assess. I have everything to say, and nothing. oh sarah, so wish we could have spent more time together here in portland. too much has happened lately. i will be reading you from afar, but will be back, hopefully to promote the next book and the next and the next . . .
Too much, indeed. I"ll await those book promos :)maybe even have some of my own, someday, as well as a blog update. You and yours are in my prayers.